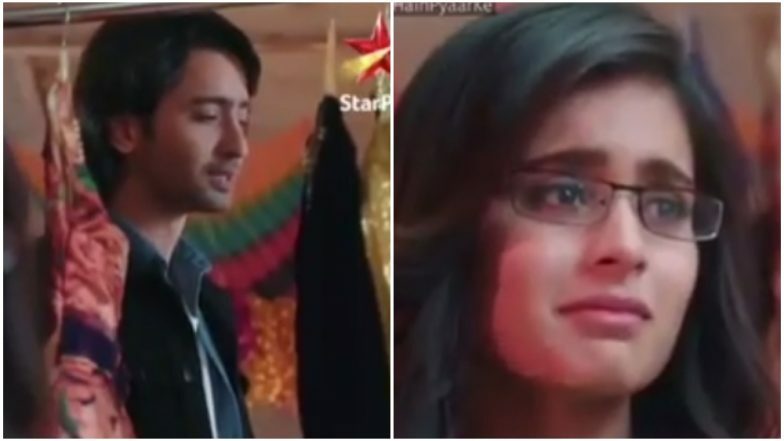 Today’s episode of Yeh Rishtey Hain Pyaar Ke starts with Abir (Shaheer Sheikh) telling Mishti (Rhea Sharma) that she should make a monthly pass for Thanksgiving to him and laughs. Mishti says he could at least tell welcome to her. Mishti tells that Kunal’s phone is left in the hospital and that Meenakshi had called but she could not hear anything, Kunal and Abir come in tension when Mishti said she picked the phone and talked with Meenakshi, Abir says that Meenakshi is thinking Kunal is in London now she will come to know that he is in Gujrat. Both are afraid as what will they do now. There Devyani is telling Rajshree that she is thankful that she took Mishti with her and she can decide what is good for Mishti. Rajshree tells that she will ask Mishti also if she is happy for the proposal. There Meenakshi is busy in preparing for the marriage of Ketki. The choreographer is making Ketki practice for her sangeet. Just then Abir and Kunal come and dance with her. Meenakshi sees them and is shocked as for how come he came here, he says he has come for Ketki’s sangeet. Meenakshi gets angry as for why he came back but when she got to know that the deal is final she becomes happy. Abir tells Kunal that he should not tell Meenakshi about Mishti’s accident. Meanwhile, Mishti is talking with Kartik and telling about the boy she is getting married and tells them all that happened. Naira and Kartik make her understand that she should meet the boy and get to know him better and then decide what to do in life. There Meenakshi is upset as Kunal did not come to her to tell what he did the whole day. Just then Abir knocks the door. Abir says that he came to talk with Parul and shows Kunal’s London ticket and tells that this ticket was booked three days before and says that he knew that Meenakshi thinks before everyone but didn’t know that she knew that the proposal would break and they will have to send Kunal to London. Meenakshi says that she choose the right girl for Kunal and if they don’t except for the proposal, it is their failure. Varsha comes down to give juice to Kuhu, Jasmith tells that they should tell Rajshree that she should not get Mishti married in that family. But Kuhu says to let it happen and it does not bother her anymore and goes from there. In Rajvansh family all dance and enjoy as marriage is there in the house, there Rajshree and Vishambar also dance with all the family members (Rishta aaya hai rishtey aaya hai track is played in the background) and ask Mishti what is her answer to the proposal? As Rajshree is going to call Meenakshi, Mishti tells her to wait and tells that she wants to believe in Kunal and know him well before taking any decision.